After the dramatic crash of Teijin, it would have been a blow for those who originally started the Aerostat Society. 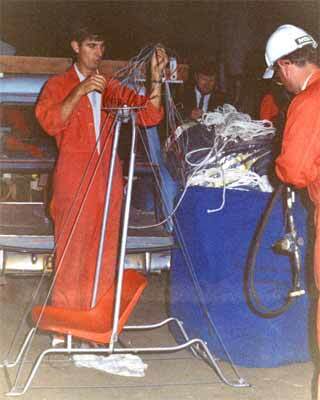 Their years of effort had been reduced to a pile of fabric and twisted metal. Most of them lost interest in the group. I was made president of the remaining group. We had no money except our own. 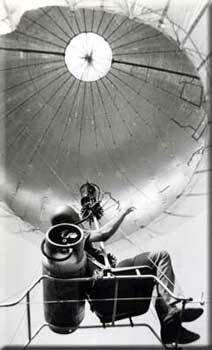 Ballooning at the time was largely an unknown, and, perhaps for good reason it was of little interest to sponsors. Terry handed me a small suitcase containing the two halves of Archimedes. Also a roll of aluminium coated polyester film. There was no burner, or basket. 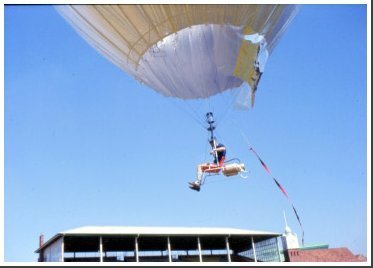 After the popularity of Teijin at Sydney's Royal Easter Show, our only future financially was to go to the next show and fly a balloon, so we tried to re-build Archimedes. The most difficult task was to develop a light powerful burner . We had no plans, but with trial and error, somehow it evolved. John Holmes (check shirt) was our gas expert. Dave Lawson (Naremburn sports teacher) with fire extinguisher. 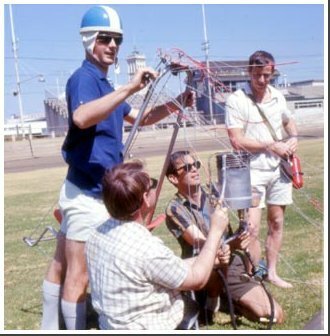 Peter Vizzard (Naremburn science teacher) in helmet. Author (Naremburn science teacher) kneeling. Except for John Holmes we were all amateurs. The author on the first test flight. 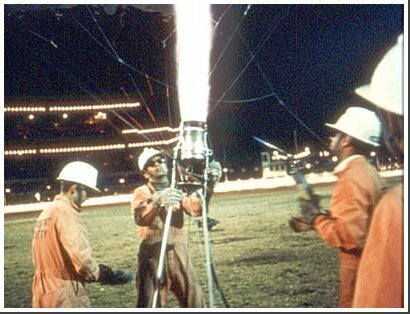 The new burner was operated by a dead man's grip. If your hand relaxed, it turned off. A separate gas line fed a small pilot light. Initially, we used a 40lb fuel tank. John Holmes on a later test flight. Here we have fitted a 10 pound cylinder instead of the 40. Quite adequate for short flights. 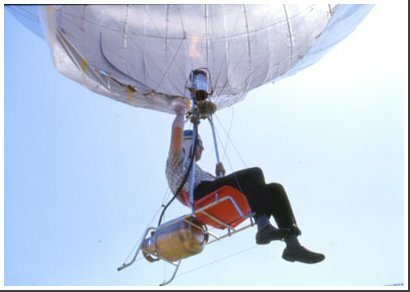 Hot-air balloons use propane as a fuel, however simply feeding the gas to the burner does not work. 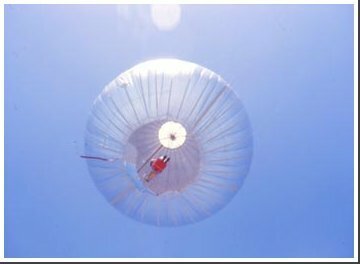 It may work on a gas barbecue, however the flow rate is so high for a balloon that gas just can't get through the feed pipe fast enough. We decided that for a show, the seated pilot was more of a spectacle than one half hidden in a basket. I taught myself oxy-welding and after many modifications and tests we built the burner. It could burn one pound of propane efficiently in one minute. In theory, this equates to about 1,000 horse power. The Royal Easter Show was coming up, and the "Pig and Horse Committee" were meeting to decide what events to approve. Peter Vizzard flew our little Archimedes back and forth past their window during their meeting - and we got the job. They gave us a deposit, so we were able to start planning a larger balloon. The frame folded up easily and fitted in a car boot. Tony Walsh is setting up Archimedes for a night time demonstration at Sydney's Royal Easter Show. The envelope was in the blue bag. For free flight however, the design would have been a disaster. The sharp legs would have dug into the ground and tipped over during the landing. I had little faith in my own welding, so all vital parts were held together with steel cables. The Sydney Royal Easter Show at night. John Holmes ready with a gas lighter. Author center. Peter Vizzard (L) about to go up and delight the crowd. 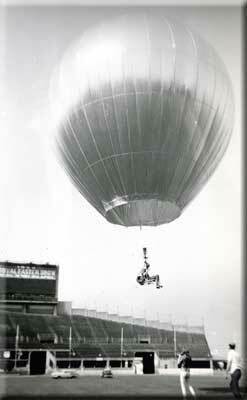 He later left teaching, and became a professional balloonist. Years later, for a while he became world champion.